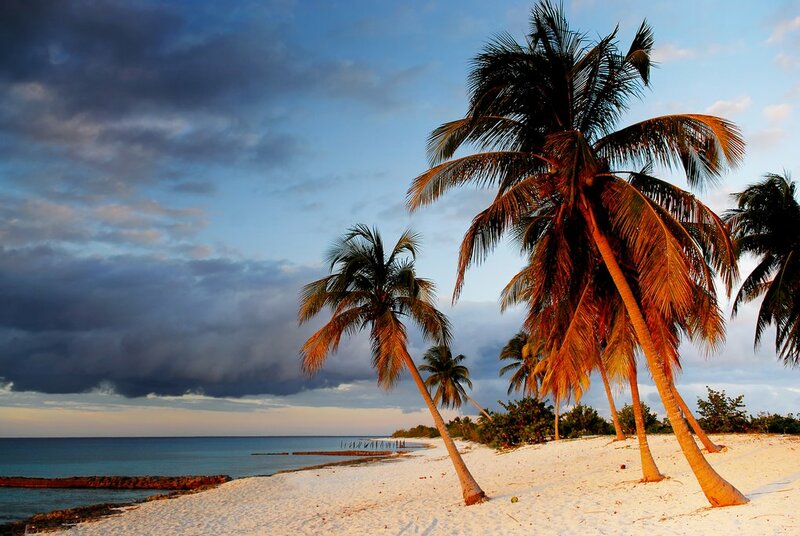 The island of Cuba is lined with white sandy beaches and surrounded by turquoise Caribbean waters. But it takes a little effort — and some dedicated travel planning — to break away from the crowds and find your own slice of paradise. Follow this handy guide to the best beaches in Cuba and you'll be relaxing under a palm tree in no time. The rewards for the beach-bound traveler in Cuba are great. The country is rimmed by beguiling stretches of sandy beach which have seen almost no development in decades, with unspoiled sands and clear waters especially great for snorkeling, diving, sailing, or simply relaxing with a cold drink. It's important to note, however, that travel logistics in Cuba can be complicated. If you're driving yourself, you'll notice a lack of signage. Public transportation works well on the island. 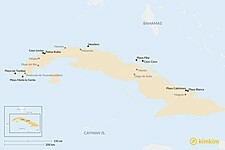 But the system mostly connects major cities in Cuba, serving fewer coastal destinations. This fact makes accessing the island's loveliest beaches rather challenging. You'll get there in one of a few ways: on a tour, by rental car (pricey), by taxi (pricier), or by bicycle (some physical fitness required). For more on planning your trip to Cuba, take a look at this article. 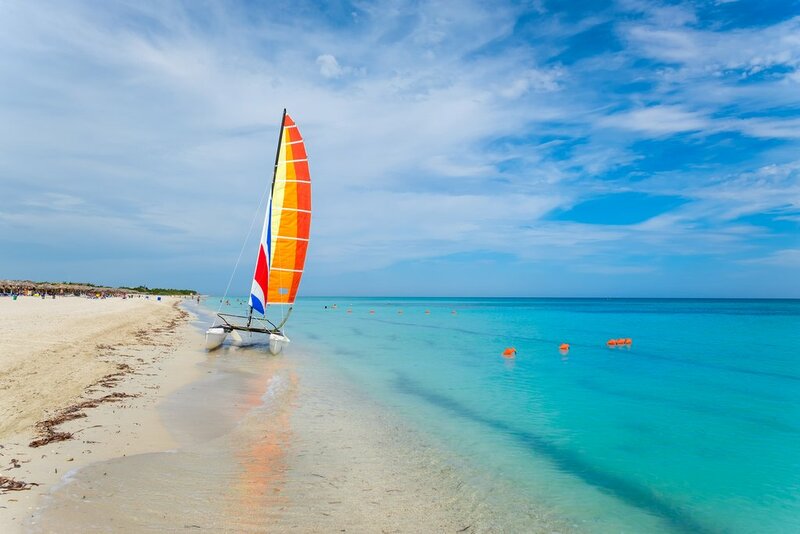 There's an exception to every rule, and in Cuba, Varadero is it. Cubans were not permitted into Varadero for a long time unless they were working in one of the resort's hotels, and although that rule has changed, the area remains Cuba's ultimate tourist enclave. Dozens of fancy hotels line a peninsula that's bordered on both sides by Cuba's most manicured sandy beaches. Every modern amenity and comfort is available, from international restaurants to souvenir shops to every kind of water sport. Consequently, the crowds are sizeable, too. Many travelers to Cuba stay only in Varadero. Despite its popularity, it's an anomaly: beach experiences elsewhere in Cuba are very different. Direct Víazul bus from Havana to Varadero. 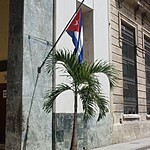 You can stay on Varadero but still visit the real Cuba just outside. 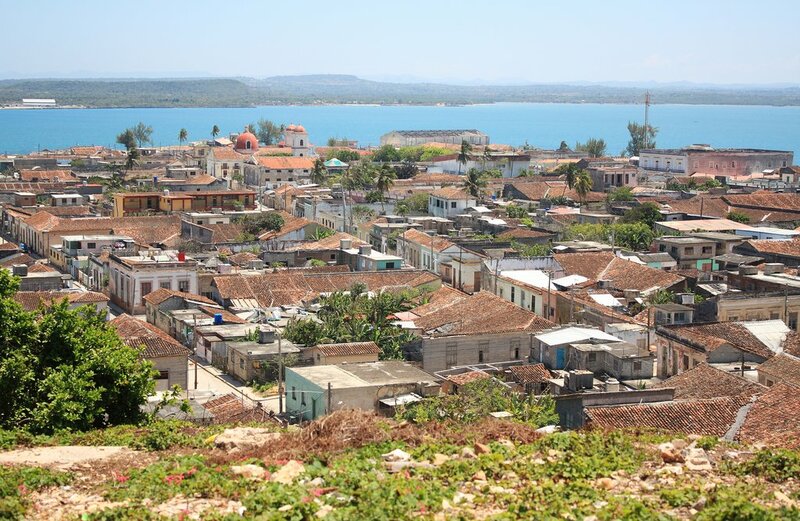 Easy day trips include Matanzas, a beautiful and rejuvenated old port city. There are also numerous cave systems nearby to explore, some of which have swimming holes. 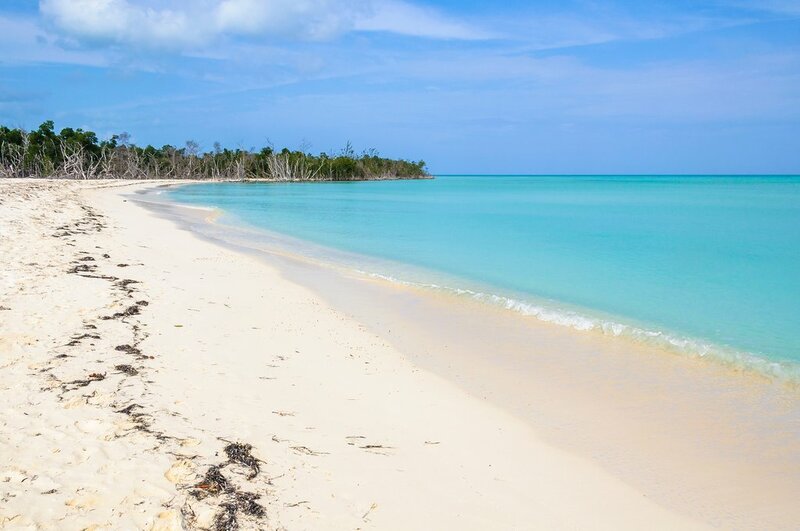 This dreamy cayo (cay, or small sandy isle), unlike many other cayos off Cuba's north coast, is not connected to the mainland. You must take a 30-minute boat ride to reach it, and the feeling of isolation this journey brings to the island's beaches is special. Most visitors choose to stay at Cayo Levisa's passable hotel, thereby buying peace and quiet away from the day-trippers. Scuba diving is popular here, with the marina offering trips out to several great dive sites, and there are kayaks for rent. Otherwise, the cayo is all about you, the sand, and the palm trees: it's easy to find your own secluded swimming spot. Víazul bus to Viñales, tourist bus to Palma Rubia (day-trippers and overnight hotel guests take the same bus), boat from Palma Rubia. The road beyond the Cayo Levisa turn-off from Viñales follows the north coast of Pinar del Río and Artemisa provinces, taking you past many more remote sandy beaches seldom seen by foreign tourists. It's a favorite road to cycle, partly because there's little traffic. Playa María la Gorda is the main destination of interest on the otherwise rugged and rarely visited Peninsula de Guanahacabibes, a national park on a snaking spit of land resembling the shape of a high-heeled shoe in Cuba's extreme west. 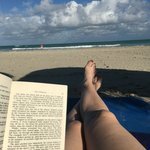 The beach at María la Gorda is lovely: picture a long expanse of white-blonde, palm tree-stippled sand with a laid-back hotel and bar nearby. But the key reason to visit this area is to dive. Mainland Cuba's best diving is here, with drop-offs and reefs just a few hundred meters out, and facilities at the marina are better than what you'll find elsewhere. For help planning a trip in Cuba's west, check out this recommended six-day itinerary. Víazul bus to Pinar del Río, tourist bus/taxi to Playa María la Gorda. 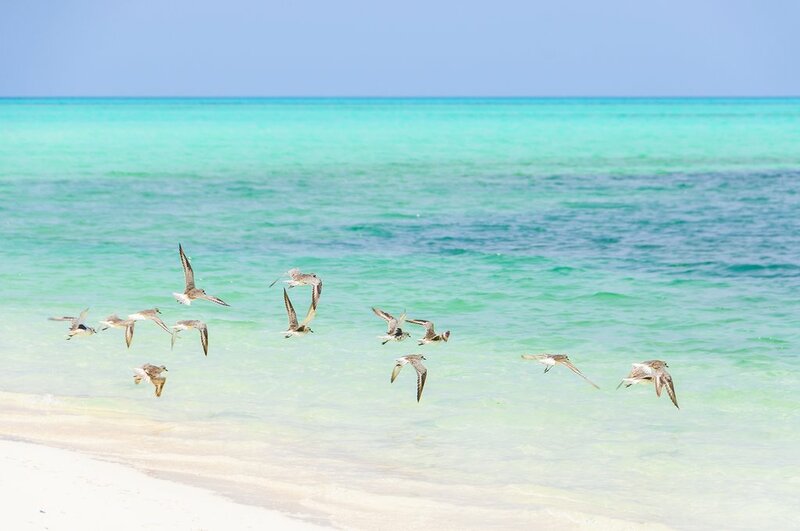 Playa María la Gorda is merely the tip of a vast national park that occupies the far west of the Cuban mainland. Playa las Tumbas, near Cuba's westernmost point, 16 miles west of Playa María la Gorda, is an even more idyllic beach with a villa to stay in nearby. Locals swear the sand on Playa Pilar is so fine that it blows away the second you let it trickle through your fingers. Backed by dunes, this serene scoop of beach lies off the northern coast of Ciego de Ávila province, on a cayo catapulted to fame by Ernest Hemingway in his novel Islands in the Stream. Cayo Coco, which you have to travel through to reach Cayo Guillermo, has plentiful hotels. But out at Playa Pilar, the only facilities are a restaurant and a small marina offering limited water sports. Which is fine, as sunbathing and swimming are the main activities here. 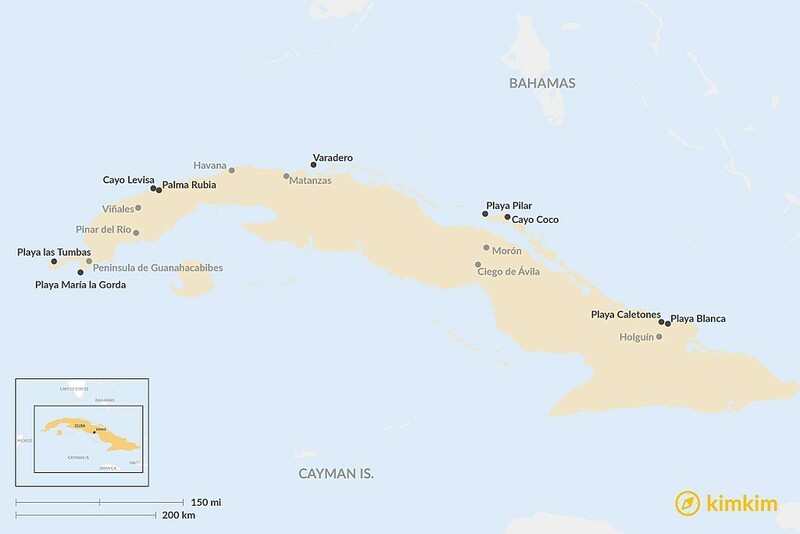 Read this article for more on the northern coast and other regions of Cuba. Víazul bus to Ciego de Ávila, train or taxi to Morón, taxi to Cayo Coco, taxi or hotel shuttle to Playa Pilar. Alternatively, flight from Havana to Cayo Coco and taxi or hotel shuttle to Playa Pilar. 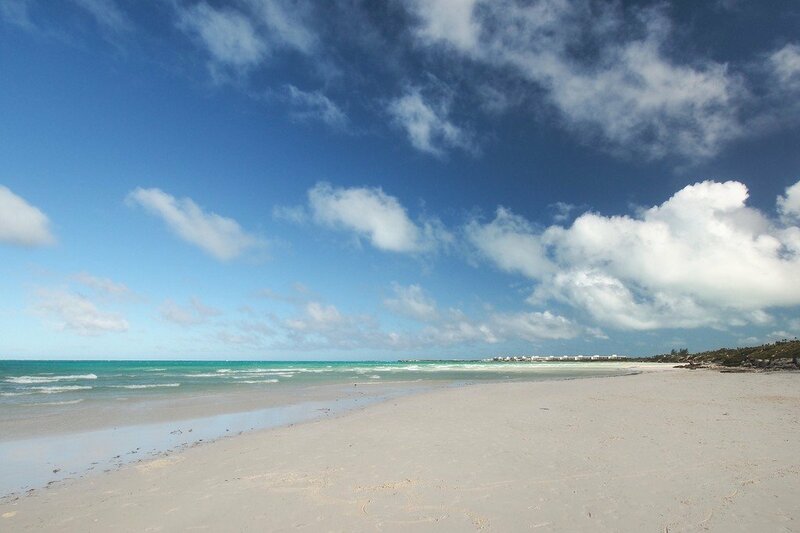 If you're staying on Cayo Guillermo, it's possible to walk to Playa Pilar. It's a beautiful 4-mile hike along the beach. Not many visitors to Cuba (and not that many Cubans) know about balmy Playa Caletones, the ultimate antidote to touristy Varadero. And that's unlikely to change anytime soon. The journey out here, first to the up-and-coming fishing port of Gibara and then along the rugged coast 10 miles west, is spectacular, but well off the radar of big tour groups. And when you arrive, there is nothing but a scattered hamlet, a low-key beach bar, and mile upon mile of tantalizing coastline, including the pale curve of sand at Playa Caletones itself. Besides the main beach, there are also pozas (natural bathing pools) set back from the shore; further along the coast, you'll find caves to explore. Víazul bus to Holguín, local bus or taxi to Gibara, local car or motorcycle to Playa Caletones. Gibara is a great base for experiencing laid-back seaside life, Cuban style. It now proudly sports a beautifully refurbished hotel as well as several good casas particulares (locally run bed and breakfasts). Take a trip by ferry from Gibara across to Playa Blanca, another enticing beach visible across the bay from town. How Many Days Should You Spend in Cuba? 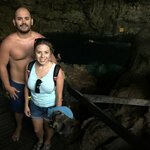 When Should I Visit Cuba?